The U.S. Army has admitted to restricting access to the Guardian, the site that has reported extensively on National Security Agency (NSA) surveillance programs as of late, over “operational security” concerns. Interestingly, the Army has a habit of blocking websites for reasons which are at times strange, including the official website for the Southern Baptist Convention, a Christian denomination with almost 16 million members. The Army removed the block after public outcry; but during the time it was blocked, the user attempting to visit the site was informed that the site was blocked for hosting “hostile content,”according to documents obtained by Jason Smathers. 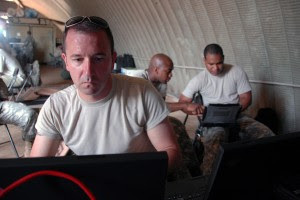 In this case, the Army restricted access to the Guardian across all Army networks, as Gordon Van Vleet, Arizona-based spokesman for the Army Network Enterprise Technology Command (NETCOM), confirmed to the Monterey Herald. Individuals at the Presidio of Monterey stated that the Guardian has been blocked since they first broke the news on the NSA data collection programs earlier this month. According to Van Vleet, it is normal for the Department of Defense to take preventative “network hygiene” measures to inhibit unauthorized release of classified information. “We make every effort to balance the need to preserve information access with operational security,” he wrote in an email. “However, there are strict policies and directives in place regarding protecting and handling classified information,” he added. According to the Herald, employees at the Presidio could still access the U.S. version of the Guardian but when articles like those about the NSA’s surveillance programs redirected to the British site, they were blocked from view. Campos stated that if an employee was found to have accidentally downloaded classified information, it would result in “labor intensive” work like the destruction or wiping of a computer’s hard drive. Furthermore, if an employee was found to have knowingly downloaded classified material onto an unclassified computer, they would face unspecified disciplinary action.